Venkatesa samo devo na bhuto na bhavishyati. Picturesquely situated on the top of the hills, Tirumala -the abode of Lord Venkateswara, is reputed as the most ancient temple in India, Sastras, Puranas, Sthala Mahatmyarns, and Alwar hymns, unequivo cally declare that in the Kali Yuga one can attain mukti only through worshipping this Venkata Nayaka or Lord Venkateswara. To illustrate that Venkatadri is unique in its sacredness it is enough to point out that Sri Ramanuja, the great Sri Vaishnava Acharya, ascended Tirumala on his knees as he thought it sacrilegious to climb on foot the Hills on which the Lord rested. 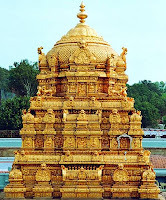 Ample epigraphic testimony about the antiquity of the temple is available and has been collected and published by the Tirumala Tirupati Devasthanams (TTD) The temple itself is believed to have I existed from very ancient times and it is said that Sri Venkateswara is referred to even inthe Rigveda. There are many more legends about the Venkatachala Hill and Lord Ven kateswara in the Varaha and Bhavishyottara Puranas. 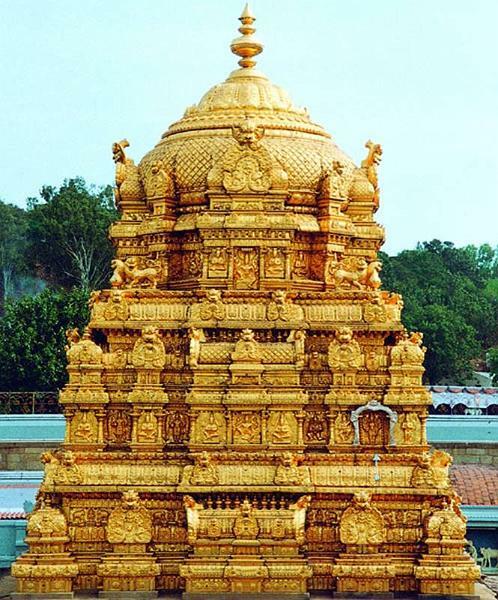 The meritorious benefits acquired by a pilgrimage to Venkatachala are mention in the Puranas and Sri Venkateswara is described as the great giver of boons. All the great dynasties of the southern peninsula had paid their tribute to this ancient shrine. 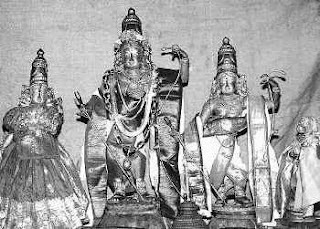 The Pailavas of Kancheepuram (9th century A.D,), Cholas, Pandyas and the kings, chiefs of \/iiayanagar (14th - 15th Century) were ardent ‘devotees of Lord \/enkateswara and they vied with each other in endowing the temple with rich offerings and benefactions, lt was during the Viayanagar period the glory of Tirumala reached its pinnacle. The statues of Sri Krishna Devaraya, the illustrious king ofthe Vijayanagara empire and his consorts were installed in the temple at the portals, in his own life-time and they can be seen even today. There are also statues of Achyuta Raya and Venltatapati Raya, Sri Krishna Deva Raya visited the sacred shrine seven times with his consorts during his reign. After the fall of the Hindu kingdoms, the Muslim rulers of Karnataka and the Britishers stepped into their shoes and many of the temples including the temples of Tirumala and Tirupati came under their supervisory and protective control. ln 1843 when the East India Company divested itself of the direct management of non-Christian places of worship and of native religious institutions, the administration of the shrine of Sri Venkateswara with a number of estates was entrusted to Sri Seva Dossji of the Hathiramji Mutt at Tirumala as Vicharanakarta and for nearly a century, till 1933 the temple was under the administrative charge of the mahants. 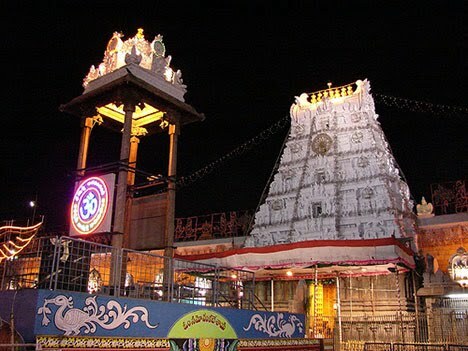 ln 1933 by a special Act passed by the Madras Legislature, the Tirumala Tirupati Devasthanams Committee was invested with the powers of administration and control through a Commissioner appointed by the Government of Madras. This committee was assisted by a Religious Advisory Council in regard to religious matters and a Ryots Advisory Council in regard to the management of the estates of the TTD. Today, T.T.Devasthanams which maintains so many temples and their sub-shrines is a conglomerate of temples brought under the first schedule 2 of the Act 20 of 1987 enacted by Andhra Pradesh Government. lt is managed by a Board of Trustees appointed by the state government. The Executive Officer is the Chief Executive of the administration. He is assisted by two Joint Executive Officers, Financial Advisor and Chief Accounts Officer, Deputy Executive Officers, Chief Vigilance and Security Officer, Conservator of Forests and Chief Engineer in various spheres of activity. Besides, there are other officials like Law Officer, Welfare Officer, Public Relations Officer. Marketing Officer, Educational Officer and others to look after several wings of administration. The Bhoga Srinivasa gets abhisheka every morning, accompanied by mantras, unlike the Dhruva Bera to which abhishekam is performed only on Fridays.At night this Deity is put to bed in paryankasana. 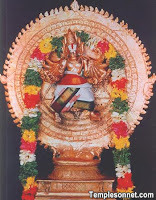 During the daily Ekanta seva this idol is placed in a silver cradle in the Sayana mandapa and milk, etc., are offered to this Lord to the accompaniment of music and songs composed by the Tallapaka poets. 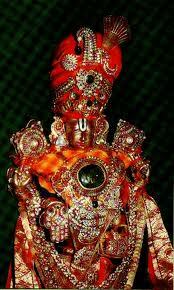 Sandalwood paste is also applied to Him every night. One peculiarity of this service in this temple is that the Ekanta Seva is performed to the i,dol of Manavalapperumal for all months of the year, except one, viz., the Dhanurmasa, when the Ekanta Seva is done for the Krishna idol. This idol was once originally called as Venkatatturaivar and stands for the anger aspect of the Lord since he is also called Ugra Srinivasa. 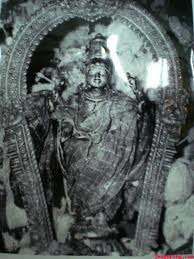 Apart from the Dhruva Sera, this is perhaps the earliest idol of the temple and in all probability this was used as the processional idol in the very early days. This is about 18" high and stands on a-pedestal of about?" height. The chakra of this image is in a slightly titled condition and could perhaps be called the prayoga chakra. 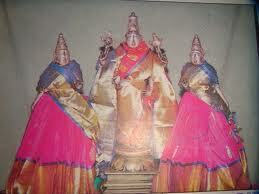 Sridevi and Shudevi both as standing figures are also seen. 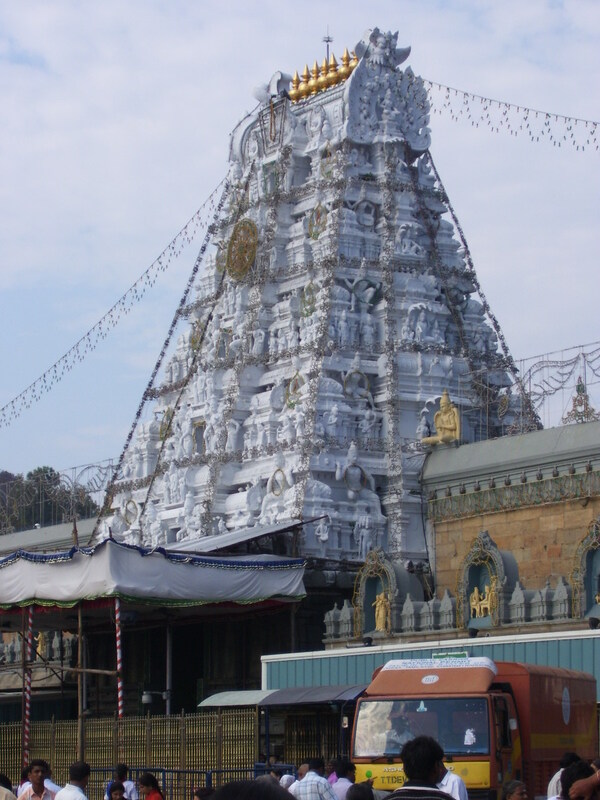 The Tamil synonym Venkatatturaivar shows that He was the deity of the temple before Shoga Srinivasa was consecrated. There are now three occasions of which Ugra Srinivasa alone figures viz., Uttana Ekadasi, Mukkoti Dvadasl and Dvadasaradhana. Legends have it that the rays of the sun should not touch this idol, and if they do, it would bring incalculable harm to the world. There is a legend that on one occasion during the Brahmotsava, a procession was going round the streets, when a fire broke out in the village which destroyed the houses, "The archakas and the devotees did not know how this disaster happened. When sincere prayers we offered, God spoke through a man, and stated that the times have changed, and that the old, lJgra Srinivasa who was the then Utsava murti should no longer be used as processional deity, and that in the glades of the mountain another Murti Would be found, and only he should be used for this purpose. It is because of this anger, that the old Murti is perhaps known as Ugramurti. 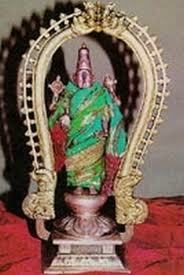 Tradition is that the new Murti with his consorts, was found at a place where the hill bowed very low, and hence he was called as 'Malai Kuniya Ninra Perumal.' This long name got shortened into Malayappan in course of time. The glade where he is said to have been found is still known as Malayyappan Konai. 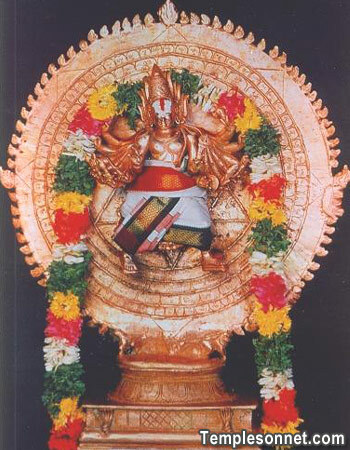 The idol of Lord Malayappa is about three feet height and stands on a lotus pedestal on a platform about '14" height. To right is the idol of Sri devi about 30" height, her pedestal being about 4". This is a pancha-Ioha idol. Her left hand is in the Kataka hasta pose, the right hand hanging loosely and the fingers held in the Gajakarna pose. Bhudevi is in standing pose, The only difference between her and Sridevi is that it is her right hand that is in the Kataka hasta pose and left in the Gajakarna mudra. The figure of Sugriva is in the standing pose and the hands folded in an attitude of prayer. This has already been referred to earlier. There are also beautiful copper idols of Angada and Hanuman exhibited separately in the Ramar Medai platform outside the shrine in the Antarala Mantapam. Opposite to these beautiful copper idols of Vishvaksena, Ananta and Garuda are found. Free Meals: Wholesome free meals will be provided to the devotees in the TTDs Annadanam Complex from 9 a.m. to 11 p.m. continuously . Free Medical Aid: Pilgrims are given free medicine aid at Aswini Hospital and Vaikuntam 'Q' complex I & II. In case of emergency, the patients will be rushed to the Ruia Hospital, SVIMS or BIRRD for treatment. Free Bus: Free buses are operated at Tirumala for the benefit of pilgrims. It covers cottages, choultries, temple and other places. Free Tonsure: Pilgrims can fulfil their vow of tonsure at Kalyanakatta, PAC I and II at free of cost. Sale of Publications: All religious publications and Video and Audio CDs and Cassettes brought out by the TTDs are sold through TTD bookstall near H.T. shopping complex (near Rambaghicha Guest house located near Varahaswami Temple. Canteens: TTDs Sri Venkateswara Guest House canteen offers wholesome meals and Tiffin at moderate rates. Full meal is Rs. 10/- only. There are many canteens run by private hoteliers. Automobile Clinic: A mobile van with mechanics and spares is available to attend to the repairs of the vehicles stranded on the ghat roads. For help they may contact toll gate either at Tirupati or Tirumala.